Want to learn about golf equipment for beginners? 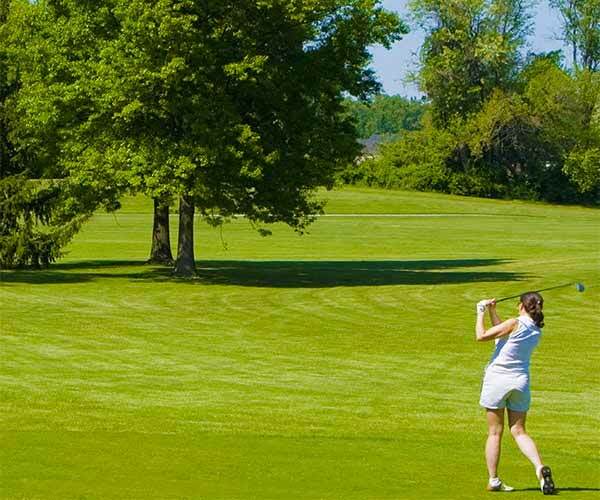 Saratoga Springs NY golf courses are the perfect place to begin! Maybe you rented some clubs, played with your friends a few times, and liked it enough that you want to learn to golf in Saratoga Springs. SoÃ¯Â¿Â½which clubs, bags, balls or even clothing do you need to buy? Are there mandatory requirements for golf equipment? How much will it cost? Getting started in golf can seem overwhelming. All you really need to get started is clubs, balls and a bag to carry them in. You probably know that new clubs can be expensive: you can spend anywhere from $300-$600 for high-end drivers, $700-$1200 for irons, and up to $300 for putters. Golf balls can cost up to $60 a dozen Ã¯Â¿Â½ not always a wise investment for beginning golfers! When it comes to finding golf equipment, the right golf clubs are the most important item . A standard set of clubs consists of three woods (the 1-driver, 3, and 5), eight irons (3, 4, 5, 6, 7, 8, 9, and a pitching wedge), and a putter, leaving room for another two clubs of your choice. The US Golf Association provides a great deal of information to help the beginning golfer get started. In addition to guidance on golf equipment, it details official rules, equipment regulations, etiquette, and lots of other information related to golfing. The good news is that you can get started pretty reasonably without breaking the bank if you shop around and buy only what you need. Top-of-the line clubs are great, but not necessary when you're starting out: there are many less expensive alternatives available that work just as well. You can find new drivers from about $35, inexpensive iron sets, and putters can be purchased new for about $20. Used clubs are another good option. You can usually find a quality set for far much less than you would pay for just a few high-end clubs. Add a fresh set of grips and they look like new. Although the rules of golf allow you to carry a maximum of 14 clubs, for the beginner, a half set is ideal. This usually consists of five iron clubs (including 4,6,8), pitching wedge and sand iron, 3 & 5 woods and a putter. Once you have begun to improve your swing and become comfortable with which clubs you perform best with, you can add additional pieces to your set. Once you have learned to golf in Saratoga Springs, NY, you can also find custom clubs available through many Saratoga golf professionals. You definitely need a golf bag to carry your equipment. You can choose from a carry bag or a cart-style bag. The carry bag is lighter and has a retractable stand that opens and closes automatically when you put it down and pick it up. Things to look for: a comfortable shoulder strap, room for all of your clubs, balls, and accessories, and a color that you absolutely love! When it comes to golf balls, the sky is the limit! An amazing amount of technology goes into engineering those little white marvels. Don't plan on spending a fortune on your balls when you first begin to learn to golf in Saratoga Springs. Visit Golf Balls 101 where you will find everything you could possibly want or need to know about golf balls: information, suggestions, even the interesting history of golf balls. There are countless accessories, extra's and add-ons available for golfers, but the most important pieces of golf equipment for beginners are just the basics until you learn your own style and preferences. Most important to remember is the #1 rule of golf in Saratoga: relax and have fun!